There is no greater way to increase students "readiness to learn" than creating a sensory smart classroom environment. With the back to school frenzy in full effect, I've got SENSORY TOOL's on the brain. I want to share with both moms and teachers of children with sensory needs all of my FAVORITE sensory tools for increasing classroom attention and compliance. I kid you not, these tools have the capability of making or breaking the school year for your child and/or your classroom. I have seen them work wonders for the sensory kiddos I see in the clinic and I have used many of them with my own children as well. If you've followed me for any amount of time, you know that I am a huge proponent for more unstructured play in the school system, more opportunities for movement and extending recess allotment times. Call my a crazy recess mom, but I feel strongly that the decline in play (and coupled decreased opportunities for movement and sensory input) are at the root cause of poor learning, attention and childhood depression and anxiety. Limited outlets for play are causing spikes in sensory processing deficits, OT referrals and over-diagnosing of ADHD. I'll try not to go off on a tangent, but I will leave you with this interesting fact: prisoners are offered a minimum of 1 hour of free unstructured outdoor time a day. If you want to read some compelling research about what movement does to the brain and how it can help increase classroom attention, check out Movement & Cognition: How Movement is an Important Precursor to Attention and Learning Readiness. Since recess extension isn't always a practical option for teachers (due to time constraints and school politics) we MUST come together as parents, as educators, as therapists and teachers to fight against the deprivation of sensory input in the school system. How Does Sensory Input Prepare the Brain for Learning? Sensory input is simply what our senses (sight, touch, smell, taste and hearing) take in and send to our central nervous system in order to help us create appropriate responses to challenges in our environment. Engaging different sensory systems can significantly impact a child's academic performance, arousal level, self-regulation and attention to task. Simply put, sensory input can be either stimulating/alerting or calming and organizing. Alerting/stimulating sensory input correlates with increased attention and readiness to learn (via the sympathetic nervous system), while other types of sensory input can help to calm an overly anxious or rambunctious child down (via the parasympathetic nervous system pathways). Sensory input tells us how to respond to our environment. It's why gentle rocking and tight swaddling can soothe a crying baby to sleep. It's why loud sounds can make your heart skip a beat. It's why cold showers wake you up in the morning. Its why you turn the music up loud and let the wind blow in your face to help you stay awake during a long drive. In the event that movement is restricted, which is typical since most classroom environments offer 20 minutes or less a day, children will innately seek to meet his/her sensory needs in one way or another. The good news is there are some AMAZING and WONDERFUL sensory tools on the market for your little sensory seekers. As a mother of a sensory seeker myself, I have learned that you have to advocate for the sensory needs of your child and often it's really just a matter of finding out which sensory tools work best for your child. It can be a game of trial and error at times trying to figure out which sensory tool is best but the biggest piece of advice I can give is to think about the child's past history. What types of activities have helped them calm down in the past? Were they pacifier suckers? Maybe they need an oral sensory tool. Were they the type that likes to go alone in their room to calm down? Maybe they need a quiet corner in the classroom with books and some noise cancelling headphones. Were they the type that likes big hugs? Maybe they would benefit from using a pressure vest. 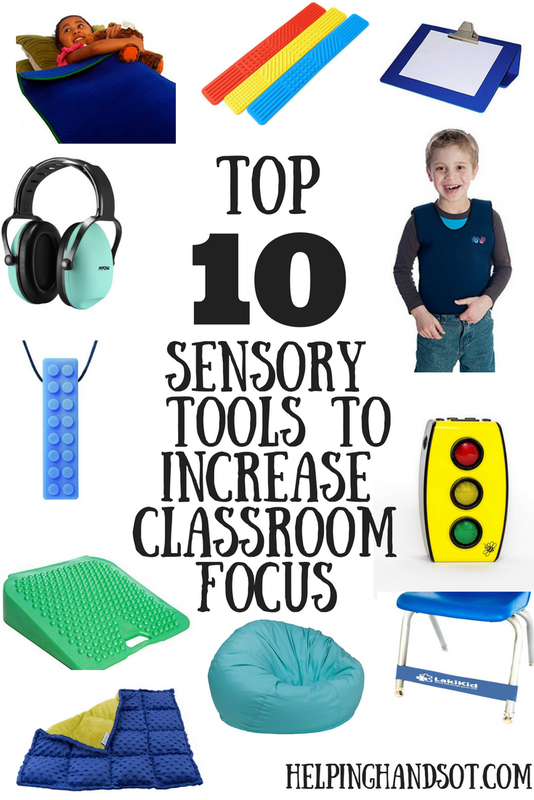 So without further ado, here are my top favorite sensory tools for the classroom. Did you know that school-aged children need 4-5 hours of movement a day to support their developing central nervous system's sensory needs? That's quite mind boggling to consider, since children are in school ALL day long! That is why flexible and alternative seating is ESSENTIAL for learners and why its at the TOP of my list. Different seating (or standing) options give the learner the opportunity to move their bodies and engage their vestibular and proprioceptive systems, which can quickly turn on all the right attention buttons. An easy way to ensure adequate oral sensory input throughout your child's day is to send send a variety of consistencies for your child's lunch and snack. Vary the texture and flavors and be sure to include something crunchy, which provides good proprioceptive input to the mouth. For kids who crave more oral sensory input, chewelry is a wonderful choice. These little wonders have come in handy so often in my practice and my own kiddo uses one too. 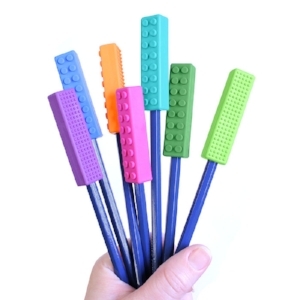 ARK Therapeutic also makes these fun chewable pencil toppers for kids who tend to chew on their pencils. 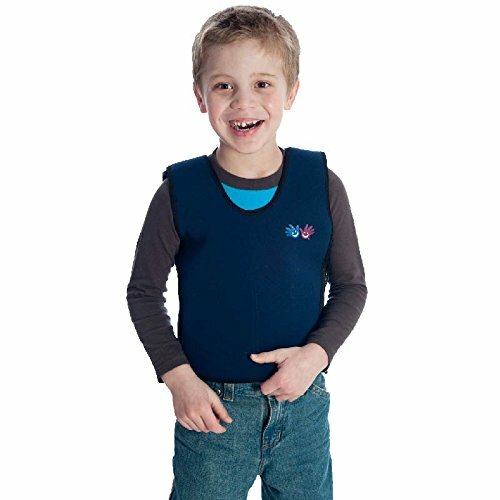 Pressure vests offer quick and effective calming input to the little learner. The pressure vest is like a big, wearable hug that provides steady proprioceptive input (body awareness) with deep pressure and balanced weight. The effect is so gentle, calming and reassuring, kids even ask to wear it. It is helpful for kids with hyperactivity, extra sensory needs or those on the autism spectrum. 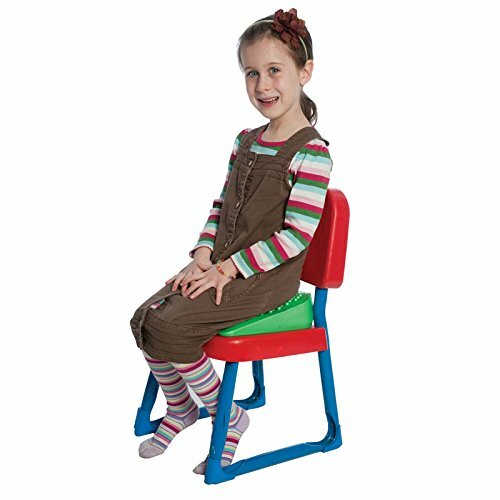 It is great for creating a calm but attentive environment during circle time or seated work! 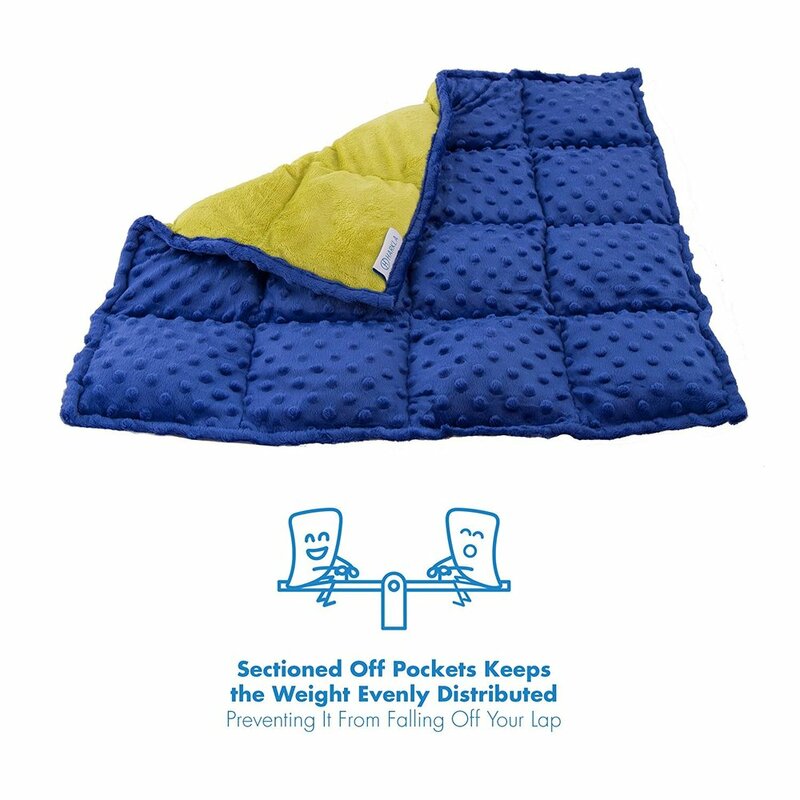 Weighted Blankets + Lap Pads are key to helping overactive children calm down and settle for nap time or even just calm down for seated work after a period of over-excitement (like music class or recess). The deep, calming proprioceptive input can take an over-stimulated child into a state of calm and regulation. Guided deep breathing can also be a great addition to the weighted blanket. Children are naturally kinesthetic learners, meaning they learn optimally when they can touch, feel, participate and DO! Any activity or craft where you can get their little hands involved can turn on the tactile sensory system and increase attention and spark interest. You can learn letters with playdough, learn science by doing experiments, learn counting and math with something tangible like shiny coins or even regular dried black beans! 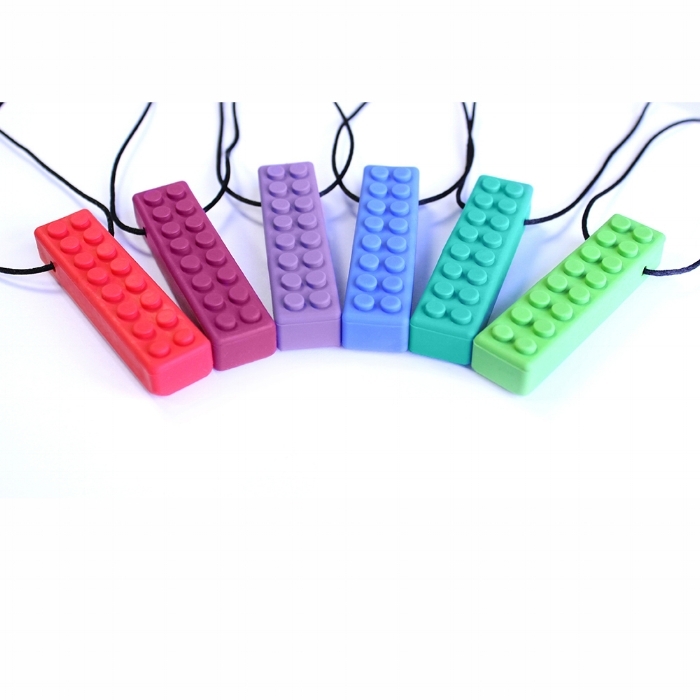 There are also those kids who need a little extra tactile input throughout the school day. These are the kids who are constantly touching and feeling everything, whether you like it or not. These types of children would benefit from a tactile sensory board or a tactile hand fidget. While fidgets catch a lot of flak for being too distracting, I have seen them used successfully in classrooms where the teacher has a written and mutually agreed upon rule system when it comes to hand fidgets. Routine songs and familiar rhymes/rhythms can prompt children through transitions and classroom expectations. They can also help the sensory child learn new information and know when to expect the end or beginning of an activity. Use familiar songs to your advantage but try to eliminate over-stimulating sounds or background noise distractions to improve focus. Children can also struggle with auditory input in different ways. Some students are easily distracted by background noise or children talking nearby and cant focus for tests and desk work when there is anything else going on nearby (a problem with auditory filtering). Others become over stimulated or frightened with loud sounds like the roar of a cafeteria (typical for children on the autism spectrum). Noise cancelling headphones are a simple but effective sensory tool for children who struggle with auditory input in any way. They are great for loud or frightful situations and also helpful for homework time, desk concentration and test taking. Visual input is simply how the child learns and takes in through the visual system via sight. Busy classroom decorations on the wall can be very distracting for any child, but especially a child who is having difficulty focusing and attending. Create a calm and natural classroom environment and eliminate loud or busy decorations or bulletin boards. Slant boards help to bring the written paper more upright and closer to the midline visual field. They can also decrease strain on the eyes, assist with handwriting (more stable and improves pencil grip position), assist children with visual deficits and even eliminate slouching. They are extremely helpful for children with low muscle tone, weak pencil grips and resistant handwriters. They are easy-peazy to make yourself with a 4 inch 3-ring binder, some velcro adhesive and a large clip. Because schools and classrooms can be noisey, over-stimulating and overwhelming at times, a designated "calm down corner" is SO necessary for the typical student and sensory seeker alike. Noise cancelling headphones, a t-pee or a book nook with a bean bag chair are all good ideas for calm down corners. Make sure to keep the visual stimuli on the walls to a minimum. You can place visual calm down jars or tactile boards in this area as well. I saved the best and most important for last! Incorporate movement in the classroom in any way you can. Use movement prior to any seated work, activities that require sustained attention or tests. Research shows that movement alone is one of the most effective tools to increase learning and attention in young children. Why? Because it turns on the vestibular system! Songs that incorporate movement are a great way to start the day! Heavy work activities turn on the proprioceptive system and have a calming but organizing affect on children. Pushing heavy boxes, lifting heavy books, stacking chairs, dry erase board erasing and door holding are all heavy work that can be used throughout the day for your sensory seeking kiddos. Fidget kick bands are one of my favorite tools for classrooms. Why? Because they offer calming and organizing resistive heavy work during seated tasks. They also increase upright desk sitting and posture AND offer an outlet for movement/vestibular input for sensory seeking kiddos in a discreet way.